Tom Rysinski/Pahrump Valley Times Tom Duryea of Pahrump prepares to throw a stone during the Sin Sity Spiel on Jan. 11 at the Las Vegas Ice Center. Tom Rysinski/Pahrump Valley Times Pahrump resident Matt Duryea signals a teammate where to throw the stone during a curling bonspiel Jan. 11 in Las Vegas. Tom Rysinski/Pahrump Valley Times Curling stones were everywhere as the Las Vegas Ice Center hosted multiple games at a time during the Sin Sity Spiel hosted Jan. 11-13 by the Las Vegas Curling Club. 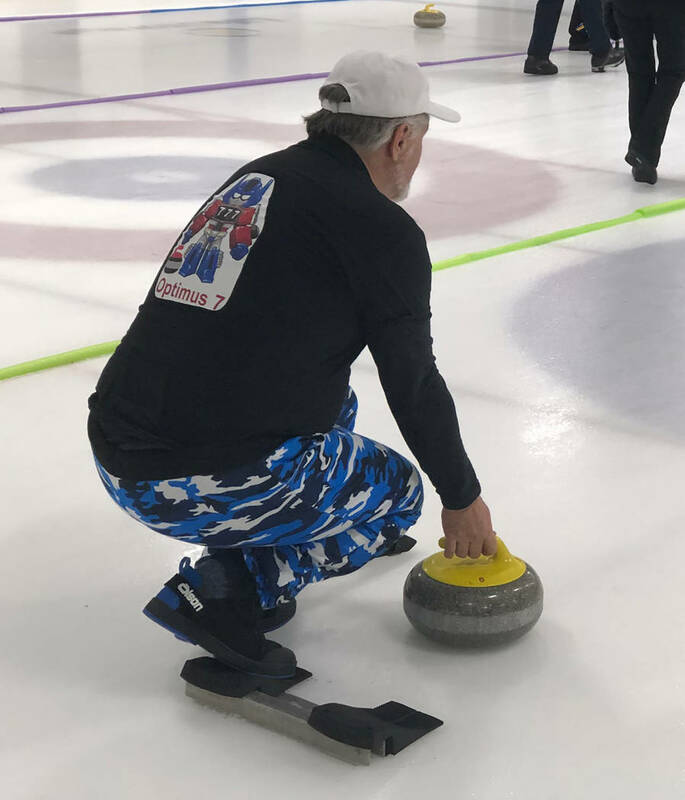 Tom Rysinski/Pahrump Valley Times Pahrump resident Tom Duryea's curling team won the Nevada state championship and will play in the Pacific International Cup in April in Vancouver, British Columbia. Janet Jackson didn’t even perform between games. Just as well. It’s much too cold at the Las Vegas Ice Center for a wardrobe malfunction. Besides, Duryea is going to Canada, not Disneyland. 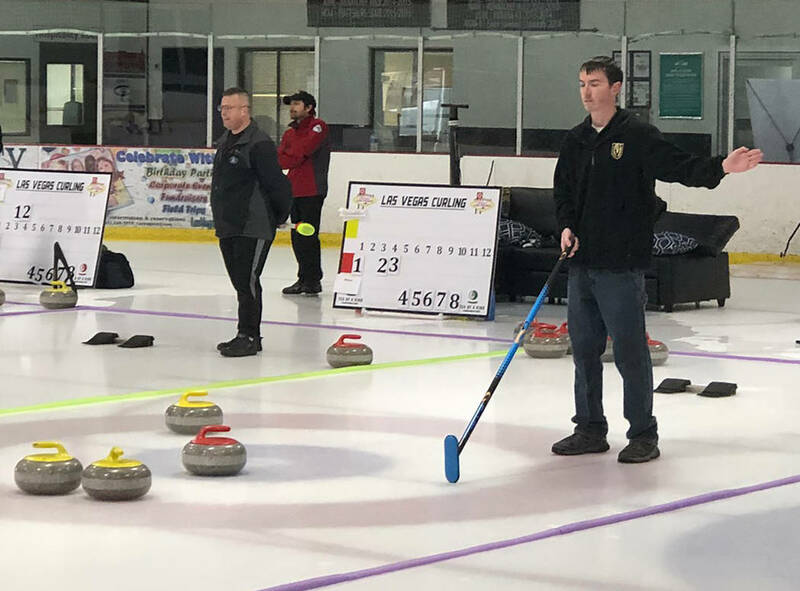 So it wasn’t a Super Bowl, but something big did happen there over the weekend, as Duryea’s Optimus 7 curling team won the Nevada state championship and earned a trip to the Pacific International Cup in April in Vancouver, British Columbia. There was drama for Duryea’s team, which includes Brad Whitlock, Devin Brower, Mike Partridge and Nolan Ehrstrom. “Two of our players have been playing for less than six months and Nolan Ehrstrom, our skip for this event, is just learning the position,” Duryea said. In curling, the skip is the team captain. “The skip assigns the other three players to their positions,” Duryea explained. “During the game, the skip calls the shots, telling each player where to throw the stones. The skip also tells the other players when to sweep and how hard. The vice skip is involved in the coin toss to decide which team throws first and, with the other team’s vice, which stone is closer” for scoring purposes. The championship came down to Optimus 7 vs. Zamboni Tracks, a team made up of Las Vegas players, on Friday night. “The final game was a real nail-biter,” Duryea said. “Optimus 7 was down by five points with only three ends to go against the Zamboni Tracks. We made up one point, then we did real well in the second-to-last end and needed two points to tie. If it is to a team’s advantage, it can “burn” the final stone of an end rather than throw it and risk an unfortunate result. With a three-point lead, nothing good would have come from throwing the final stone. Duryea’s team came close last year to going to Vancouver, but April will mark his first time competing in the event. The state championship was held simultaneously with the Sin Sity Spiel, a 28-team bonspiel hosted by the Las Vegas Curling Club. Duryea had a team in that, too, as the Over the Hump team includes his son, Matt, and two players from Las Vegas. “Our recreation league team, Over the Hump, lost in the quarterfinals of Division C to Team Walker from Alberta, Canada,” Duryea said. Between the bonspiel and the state championship, Duryea was doing a lot of curling. Sometimes that meant throwing the stone and sometimes that meant sweeping, which is the part that seemed to capture the nation’s fancy during the last Olympics. Which does not mean you can grab a broom out of your kitchen closet and go curling. The brooms used in the sport are smooth on the bottom and are used to smooth out rough spots on the ice to increase the speed of a stone. The rough spots are caused by what is called pebbling, sprinkling water on the ice surface to create dozens of bumps. So if you’re following along, in curling they litter the ice with rough spots just so they can smooth them out later. As housework, it makes no sense. But in curling, it’s the key to the whole game. Without pebbling, every stone would glide smoothly down the ice, and it would be nothing more than slippery shuffleboard. The need to sweep comes with the need to ponder strategy, and more time is spent pondering where to throw a stone than actually throwing and sweeping. The decision made, two players run with the stone after it is thrown, ready to sweep if need be, while another is stationed in the house — the thing that looks like a bull’s-eye — ready to help. The opposing team also has a sweeper at the ready in the house, in case the thrown stone, or a stone it strikes, needs a little help exiting the premises. Because points are scored by having your stone or stones closer to the center of the house than your opponents’ stones, sometimes you will see a player from each team simultaneously sweeping frantically after a thrown stone makes impact, each trying to guide the other’s stone out of the house. In curling, getting the other guy’s stone out of scoring position often is a bigger part of the game that getting yours into it. It sounds mean, but you won’t find a more cheerful group of competitors than you will on the ice during curling. 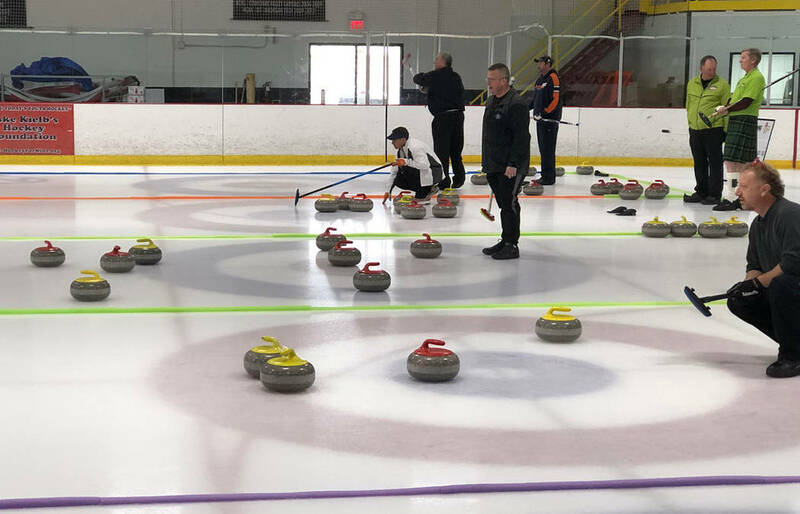 Before they start, everyone shakes hands and wishes each other “Good curling!” If each team has a stone close to the center of the house, each side’s vice skip goes out and amicably decides the points. “And you’ll notice I had a couple of good shots in the last game and the Canadians congratulated me on the shots,” Duryea said, referring to a team from Vancouver that defeated his Over the Hump team Saturday during the bonspiel. Of course it’s friendly. Canadians do it. No amount of curling is enough for the sport’s aficionados, and Duryea has plans aside from the Vancouver trip. 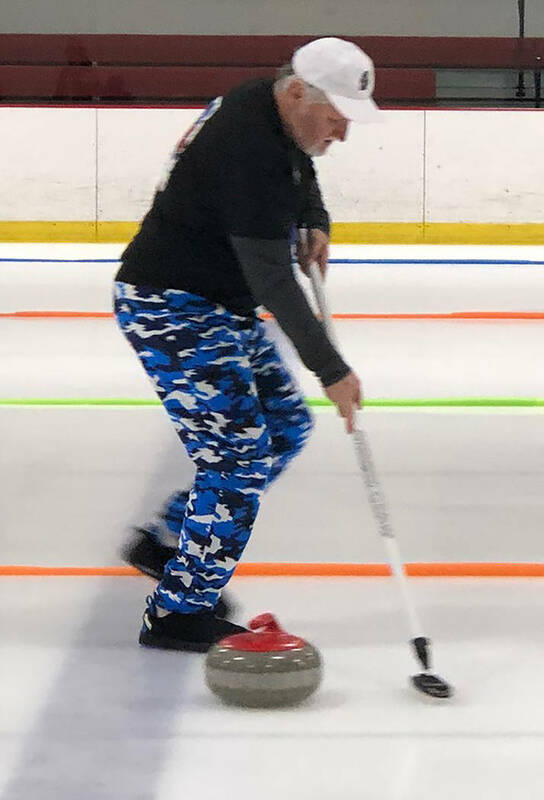 “We plan on traveling to Valencia (California) this July to take part in the Hollywood Curling Club’s bonspiel, as well as returning to league play in February,” he said. In between will be the biggest event in Duryea’s years of curling. And while the joys of throwing a 42-pound piece of granite down a sheet of ice while other people sweep to guide its path might escape many desert dwellers, a state championship and the chance to participate in an international competition is pretty cool.